Surely the best way to enjoy this season’s peaches! Make sure everything is well chilled, including a carafe and glasses to hold the bellini. Wash the fruits, half the peaches and remove the stone. Leave the skin on. Blitz the peaches and raspberries in a blender until pureed. 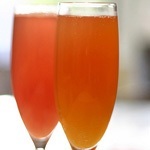 Pour into the carafe and add the Prosecco, making sure the ratio is roughly 1 part puree to 3 parts Prosecco. Add a few drops of lemon juice and sugar to taste. Serve immediately in chilled glasses. Wash the fennels, cut lengthways and then in wedges but try to leave the leaves attached to the bottom so that everything stays together when cooking. Toss the wedges with a little oil and sea salt, then place on a hot grill pan and cook on a medium heat until tender (about 10-15 minutes), turning when required. Once cooked, dress with chopped parsley and lemon juice and zest to taste. Adjust seasoning if required, add freshly ground black pepper. A great side dish to fish! 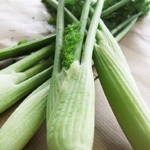 Wash, top and tail the cougettes, then slice lengthways. Season with salt and leave to rest on a plate. The salt will help to lose some of their water. Grill the slices for a few minutes on each side until soft. Now finely chop the Parma ham, put in a bowl and mix with the robiola and chives. Add pepper to taste then stir until creamy. Rest in the fridge for 15-20 minutes. 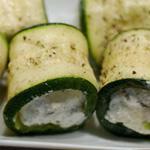 Prepare the rolls: Spread some of mixture on to the courgette slices and simply roll up. Put on the serving plate and sprinkle with chopped chives. Dice the potatoes and thinly slice the onions. Sweat the onions in butter and oil, then add the potatoes and the beans. Let them fry gently for a couple of minutes, then add enough hot stock to cover. 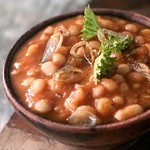 Leave to cook on the lowest heat for about 4 hours, occasionally stirring and adding stock when necessary. Adjust with salt if necessary. Slice the guanciale in strips, fry it until crispy, then mix it (together with its juice) in the stew with the finely chopped rosemary.Serve very hot on some toasted rustic bread, with a crack of black pepper.